Over the last decade, Dutch healthcare has undergone a considerable transformation and this is set to continue in the coming years. We see various changes in care demand and supply, technological developments and changes in policy and management. The Netherlands is dealing with a continuous rise in collective expenditure, partly caused by its ageing population and therefore a growing number of vulnerable elderly people and patients with chronic disease. However, the changing role of the patient as a care consumer, the growing number of medication options and new perspectives provided by developments in ICT and digitalization are also changing the care landscape. New collaborations emerge where care professionals, care providers and other stakeholders work together in many different ways within a kind of network-organization. Thus the classic boundaries between primary, secondary and tertiary care are starting to fade. These changes make us realize that we cannot continue in the same way and that a transformation of the care system is inevitable. 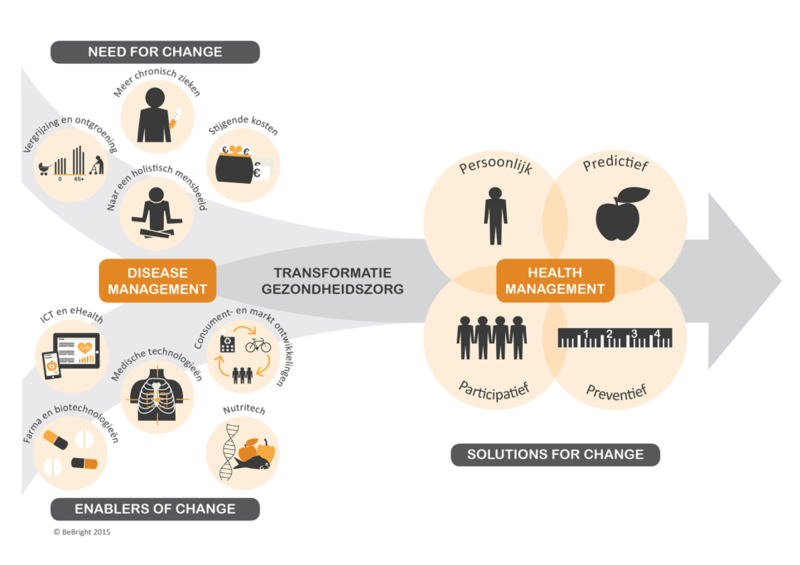 A transformation that will make Dutch healthcare more efficient and effective and better equipped to meet the (changing) needs of clients and patients. Important principles are a patient-centred approach and a focus on general wellbeing instead of merely the absence of disease. The latter requires a transition towards a new vision for healthcare, which will ultimately lead to a health management system with patients or clients and their quality of life at its heart. This transition can be accomplished through technology, the changing position of the patient, and knowledge development and exchange among care providers. What is the impact of these trends and developments on your organization? How can your organization adapt in order to remain future-proof in this rapidly changing care landscape? BeBright has very extensive knowledge of the trends and developments in curative care and a view on the consequences for the provider, its strategy and desired transformation.